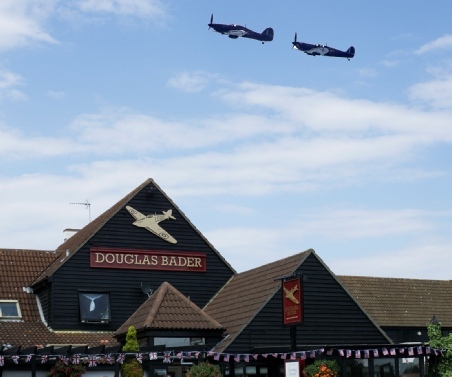 Congratulations to Peter Davies, who conceived the idea to celebrate 100 years of aviation history at Martlesham and to his team, who put together the event over a period of three years. The original concept was conceived by Peter as a celebration of research and development at Martlesham. Not only the history of the airfield as a centre for British aviation research and development, but also British Telecom, who arrived here in the 70's and have also been responsible for ground breaking and innovative developments in the field of telecommunications. The MH100 committee also wanted to include the concept and development of this unique village, with its design feature of a series of hamlets connected by footpaths with a central village green away from traffic. The new Martlesham Heath village is built on the site of the old aerodrome. Many displays were exhibited in the church of St Michael's and All Angels. All telling the development and innovation theme. Martlesham Heath Aviation Society provided many pictures of historical interest as well as videos. British Telecom were present as was a stand from our friends at Bawdsey Radar museum. RAF Martlesham Heath was directly involved in the early development of airborne radar.The village history was also displayed. Many stands from organisations too numerous to mention were dotted around the village green. The weather was perfect as we welcomed descendants of the American Eagle squadron who were based here for a time in 1941. 71 squadron RAF was one of three squadrons formed by the RAF to help us in our time of need when we stood alone against the Nazi menace. Various photos and a video of the unveiling of the commemorative stone by John Cooper. Press VIDEO to view. Left. 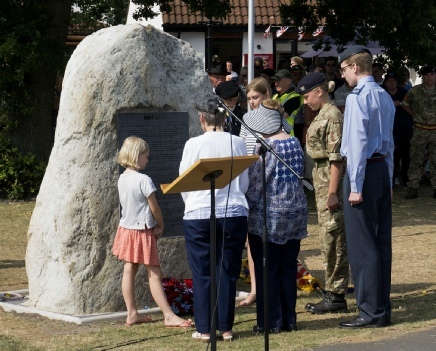 HM Lord-Lieutenant of Suffolk, Clare, Countess of Euston unveils the permanent commemorative plaque. 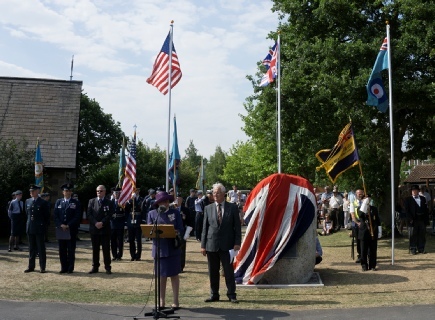 Descendants of the American airmen who fought with the RAF in the “Eagle Squadrons” Laying a wreath at the foot of the new Commemorative Stone in memory. 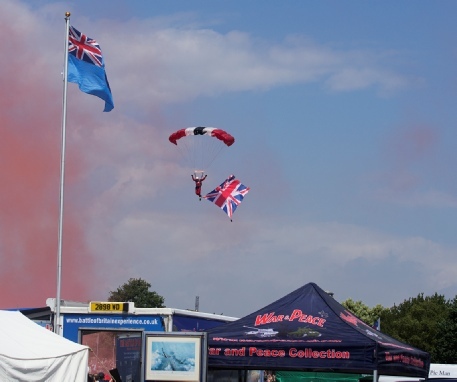 The Red Devils - The British Army Parachute Regiment Display Team make another spot on landing on the village green.